Don’t scrape that tree. 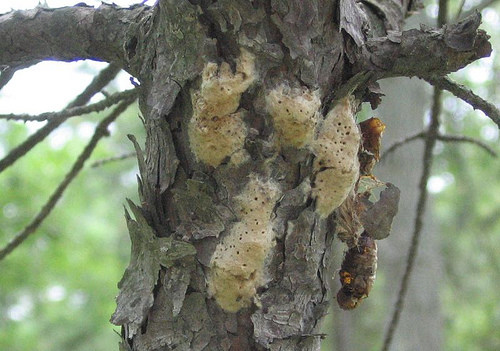 The Bay County Gypsy Moth Suppression Program is conducting egg mass surveys for the fall. The surveys are used to determine the size of the Gypsy Moth population in wooded areas of the county. If the egg mass surveys indicate that the population may be growing, the area will be included in spray operations next spring. The county program works to control the bugs, which feed on the leaves of hundreds of species of trees and other plants, commonly oak and aspen. For that reason, residents are advised not to scrape egg masses off their trees until after the survey and count in increasing. A low count can disqualify a property from being sprayed next spring. A new study evaluates the impacts of power plants on Great Lakes water resources. According to the Great Lakes Commission, about 90 percent of the electrical power in the Great Lakes basin is produced by thermoelectric plants, which use 26 billion gallons of water a day for cooling. A commission report based on 18 months of research says that about 25 percent of water used for power generation in the basin comes from groundwater and tributaries. The report also says about a quarter of all watersheds in the basin may be ecologically vulnerable to water withdrawals under certain “low-flow” conditions. Such conditions are likely to be more frequent in the future as the impacts of climate change become more severe. The research is called the Great Lakes Energy-Water Nexus project. The analysis also identified ways for public utilities to evaluate environmental impacts and use those results in decision-making, including requiring periodic water resource impact studies. The Great Lakes Commission is an interstate compact agency established under state and federal law. The Commission consists of governors’ appointees, state legislators, and agency officials from eight member states. Commission offices are located in Ann Arbor. Three Bay area elementary schools were “Wired for Wind” in October. Washington, Hampton and MacGregor schools received 4-H funding from Michigan State University to enhance their science education programs. Students worked in teams to design light-weight, fast-moving wind turbine blades. The blades were then tested to see how much electricity they could potentially generate. The student scientists made changes to their designs based on the results. The same program was conducted nationwide, as part of a Wired for Wind national science experiment. The idea is to get young people involved in implementing alternatives to traditional energy production. According to Bay County officials, there is a national shortage of young people pursuing science college majors and occupations. The 4-H organization is working on a goal to engage 1 million new young people in science, engineering, technology and applied math programs by the year 2013. — Photo by John B.